The awesome thing is, we’ve definitely camped out at the peak a little longer than our trip in the valley, and I can’t say that it was without God. He has definitely had a HUGE hand in the events that transpired, even just in the past 2 weeks! Before I move on to , to make a long story short Kim had lost a pretty cushy gig with a certain company who may or may not rhyme with Bank of Ashmerica. I truly believe that this happened only to clear her schedule to work with this incredible company. In her first week, she absolutely loves it. I love that she loves it, it’s incredibly awesome. I said “Meh” in the headline, because as far as the blog goes, I really felt like I lost a little momentum mid-March, only to pick up towards the end. I just really didn’t feel like writing, or even thinking or looking at the goals. Because of this, my goal list was not attended to as much as I would have liked. Um, almost doubled January and February’s numbers, sitting up at 35 through feedburner. Crazy! Thanks mom and dad for getting the cousins on board! Interestingly enough, after talking with Alece over at Grit & Glory, I may dedicate April to a new approach to responding to comments. We’ll see, I still haven’t decided yet but I will not deter from responding to each and every comment. I just may do it a bit differently. 11) Influence at least 1 person to start blogging. Ok so maybe March wasn’t as “Meh” as I thought it was, but how about new goals? So, that was my March. 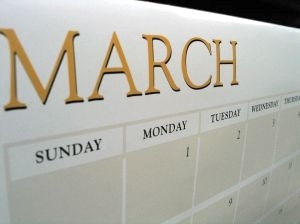 If you had any goals (blogging or otherwise), were you able to knock any out this month? I’d be curious to hear the ‘why’ and ‘how’ regarding that goal. Not that I am opposed, no. Simply curious as to what would cause you to wish to pursue it. Keep on being you, Ben. You do that, and you’ll have me as a diligent reader. Thanks Donald, you are a great encourager and I appreciate it. As far as the why and how for seminary, to be honest I am still trying to figure out why the desire has been put on my heart. I know that once it becomes clear to me, I will definitely create a post to share in and of itself. Wow, what a month for you. Thanks for taking the time and pulling the month together like this. Keep up the great work! I’m excited for you. Reach those goals buddy. Moe, thank YOU for reading and just being Moe. My goals for the month did not get met. Mostly because the real job was so busy. Was not able to do the things I wanted with the blog and give it the focus I wanted. Maybe next month. Congrats on the seminary. That’s cool! Good luck on the future goals and am loving being [art of the community here. March must have been a busy month for a lot of companies, at least that’s what I’ve heard. For sure my friend! Just let me know and I will do likewise. I’m excited to hear more about seminary… that’s awesome. But… keep pushin’ on. As you know you have a readership that really likes where you’re heading! Either way, thanks for your comments over here, looking forward to Wednesday’s coffee! Not for nothing, but given your post here, and the comments thus far, is it any wonder why there is such a strength in the whole “e-brothers” community that I cling to so fiercely? I can’t wait to see where you and all of us will be in 3 months from now. I think we’ll be in June, right? Congrats to Kim on the new gig. Hope she continues to love it. I’m still trying to figure out exactly what to do once my MBA is finished. I’ve maintained the goal of posting every week day and traffic has increased. Also I finally got ride of the plain text header w/ a simple logo I made using PowerPoint (hey, it was free). Hope your April is EPIC! Hey KC, don’t feel alone. I’m trying to figure out where to go when my MBA work is done as well. Good thing it will be a while before I’m done. I’ll be praying you receive direction. Ben, I think seminary is awesome. Will be praying you receive confirmation and that the path be clear. Thanks Allen, the prayer’s definitely appreciated. Your header is smoove. Yes, I used a v.
I think, when you finish your MBA, you might sleep for 4.5 days straight. Thanks for the mention, Ben. That is one great group of ladies to be in. My goal for this month was to actually step back some from blogging a bit to find balance in my online/offline life. I met that by only posting 2-3 times a week instead of the 5x I was maintaining before. My goal for April is to feature other writers more…which is already off to a great start with the guest posts that are coming in. Hope you have a great weekend! 2-3x is good too, and with other writers guest posting you should be able to find that balance pretty quick. I appreciate the mention, Ben! I haven’t set clear goals, and I think that’ will become part of April, because April at MessiahMom is about stewardship, and a realistic stock of what one has is essential to stewardship. I love coming into a place of community, and I think you have that here. I love the blogging community in general, but you seem to ask questions that provoke thoughtful response. Sounds great! I really like your blog…count me as a subscriber! thank you for the shout-out(s), ben. that was an unexpected surprise. oh… and here’s to a better month! Thanks alece, wish all the luck to Grit too. Keep doing how you do. I was able to stay with my goal of posting 5 times each week, even when my blog went down for 24 hours. I also had a case mid-month of struggling with waht to write about, it happens and you push through. Seminary- sounds excited and actually I am a little jealous. Good luck with it. Where are you looking? So, I don’t know what happened. I thought I left a comment here, but now I’m guessing that was on Twitter. So, now I feel like a jerk for not commenting here when you totally gave me an awesome shout out. Ben…this was an answer to a prayer. Seriously. God works in mysterious ways. Much love for the shout out, bro. And, as Melissa said-what an awesome list to be a part of. No biggie Keri, you’re still awesome. Plus I found out you like Musubi, so that makes awesome +1. Wait, answer to a prayer? Care to ‘splain? March was pretty good. My goals were to spit hot fire and not destroy the Babychild. Mission accomplished. I had a couple articles in POTSC. Caught a raccoon. Blogged about some ridiculous junks. Managed to release a kid I mentor to do his own mentoring, and hopefully picked up a new disciple. I also gained 5 pounds. But I spit hot fire. That’s awesome re: POTSC, and wait a raccoon? Oh dude I’ve visited the Blogging, just haven’t commented yet. I shall do that!